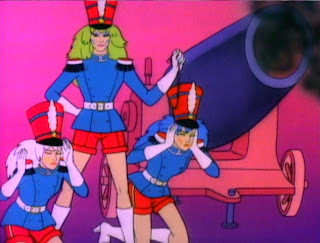 Review: Throughout the 80's it seemed like there was more shows made for boys than girls, yes girls had shows like Rainbow Brite, My Little Pony, and Pound Puppies but they had very few shows that went outside the cutesy edge. 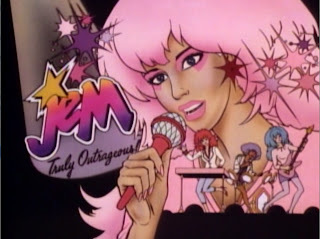 There really was only 2 that I could think of that stepped outside the cutesy little kid style and that was She-Ra and the show we have here Jem And The Holograms! 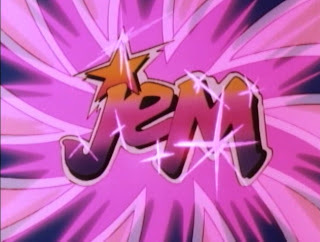 This show did appeal to the occasional boy which at the time was not me, but I did know a boy or 2 that did actually like and follow Jem. The storyline of this show is simplistic and pretty easy to follow for the most part like alot of kids shows generally are and looking at it now it's decently entertaining. With myself never really watching it as a child I now don't really have a nostalgic feelings towards it so my review may be a bit different than most. The basic plot of this show is about a girl named Jerrica Benton whose father dies and she inherits a record company named Starlight Music and Starlight House, but things aren't as easy as they seem because there is a co-owner who is out to gain total control and is using his rebel girl band The Misfits (nowhere near as cool as the real life punk band of the same name) to do so. 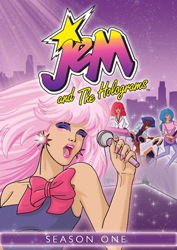 Jerrica uses a system called Synergy to turn into mega pop star Jem and her band called The Holograms! As I said the plot of the story is pretty simplistic which is fine for this show. Personally no matter how hard I tried I couldn't get into it one bit, but honestly it is one of those shows where you will either like it or you don't. 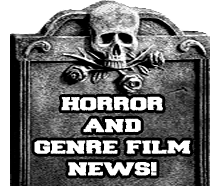 It does have a few things going for it but not enough to really make me get into it more than I did, I did like the fact that it is a cartoon that is musically themed and that it in ways has a sci-fi feel to it as well. After watching this season I can definitely tell that who ever was behind Hannah Montana had to of gotten some inspiration from this show, mainly dealing with the girl who tries to hide her pop star lifestyle from the people around her. The things that I was surprised that I didn't care much for was the animation which is very odd considering it's the same company who did the animation for Transformers and Dragonball Z. I just thought the animation was bad, I know plenty would argue with me on that. Also I found the storyline to be quite stale after a short bit, but that could be because I didn't get into the show. None the less I could see how some people could really enjoy this show and really like it, there is a certain charm to it. Overall like I said before I didn't care for Jem but I certainly can recommend this set to people who are already fans and to those who are wanting a show that can be in it's own way empowering for women! Time Length: Approx. 10 hrs.